Authentic, traditional, down-to-earth and modern – this is how to describe the Gersberg Alm hotel, which is situated far from the hustle and bustle yet close to the city of Salzburg. With warm hospitality and plenty of attention to detail, the hotel’s staff create accommodation that gives our guests a healthy portion of quality of life and a feeling of sophisticated joie de vivre. Right from the moment you enter the hotel, you'll feel 100% great. This comfortable hotel is a place of sincerity and friendliness. Personal service is our priority and that is something you will feel every moment of your stay at the Gersberg Alm. Wooden shutters, dark wood beams and lovingly-chosen decorations: the Gersberg Alm is a true treat for the eyes. But it isn't just the hotel itself, but also the unique views, that will take your breath away. The city of Salzburg, with its winding alleys, cathedral, numerous churches and the Hohensalzburg Fortress, is at your feet. Grab your ball and racquet and play some tennis on our hotel tennis court just outside the hotel's front door. Relax on our spacious terrace and take a refreshing dip in the cool water of our swimming pool. Or rest after a day discovering the Salzburg old town or hiking in the Salzkammergut with a trip to the sauna. End your day with a few rounds at the hotel's own ninepins bowling alley and enjoy a fun evening with your family, friends or co-workers. Sleep deeply in our comfortable and carefully-decorated rooms, and dream of what you'll do tomorrow! From breakfast to lunch, and dinner in the evening: take a seat in our restaurant and get ready to enjoy. The delicate flavours melt together into one delicious composition, incredible scents fill the air and delicious treats spoil your senses. 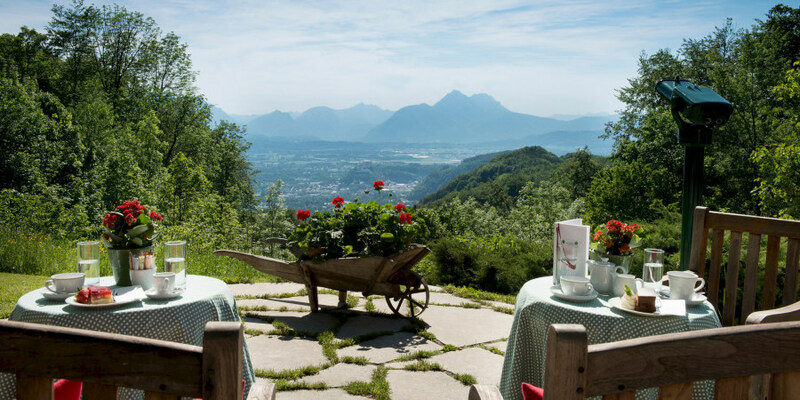 Would you like to take in the beautiful views of the city of Salzburg? Send us your non-binding enquiry. We look forward to welcoming you to the Gersberg Alm hotel soon! In the mood for a hot bath?